← Faculty representation: Here we go again! How would you describe Canada’s Universities in a few words? U of T is huge, traditional, well established, and therefore academically credible. McGill’s where the party is at and located in the “coolest” city. Concordia is a lesser McGill with a lot of protesters. The University of Calgary is incredibly average, quite cold, and yet somehow important because it’s in Alberta. UVic is rabbits and drinking, as well as a safe ferry-ride away from parents of Vancouver-native students. Queens is engineers with purple jackets and guarantees a fun time. UBC is… is… hmmm…that’s a good question, what is UBC? Asian? Rain? But these are Vancouver’s stereotypes. 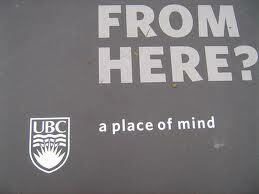 It is not far-fetched to say that UBC fails to have a solid image or branding relative to its counterparts. Very sad indeed. Aw, but don’t cry UBC…because if this is the case, I believe it to be UBC’s strength. Leaders of any organization, institution, or corporation are always out to brand themselves, to market their image and get attention –Universities are no different. A branded product will thrive brilliantly if the conditions are right, yet is also extremely vulnerable. Take the example of the never-ending Microsoft-Apple Wars. Both have won battles for opposite reasons that are independent of the quality of their software. While Apple wins at marketing its sleek and snazzy products, Microsoft is still running on its open-source advantage. I am in no way comparing UBC and McGill to Microsoft and Apple; the point is that there is a serious advantage to not being locked into one’s own image. In the past year, Ministers in both Germany and the UK have publicly acknowledged that multiculturalism has failed in their countries. I’m not saying that Canada is void of any of these issues, but having a lesser-established identity and tradition compared to European countries is what makes Canadian culture more dynamic, adaptable, and, in some cases, more interesting. The purpose of branding a product is to make it stick; yet being static is becoming increasingly dangerous in the age of tweeting and 24-hour news. Having no pre-conceived image of a place can mean having fewer expectations and a more open mind before one actually visits it. And where better to keep your mind open to new ideas than at a University? UBC, stay classy, and stay brand-free.